A2A is anchored by two world-class protected areas: Algonquin Provincial Park, in Ontario, and Adirondack Park, in New York State. In addition to these parks, A2A includes more than 30 protected areas, including one national park: Thousand Islands National Park, Ontario. The A2A landscape is recognized globally by two designated UNESCO Biosphere Reserves: the Frontenac Arch Biosphere, in Ontario, and Champlain-Adirondack Biosphere Reserve, in New York (and Vermont). 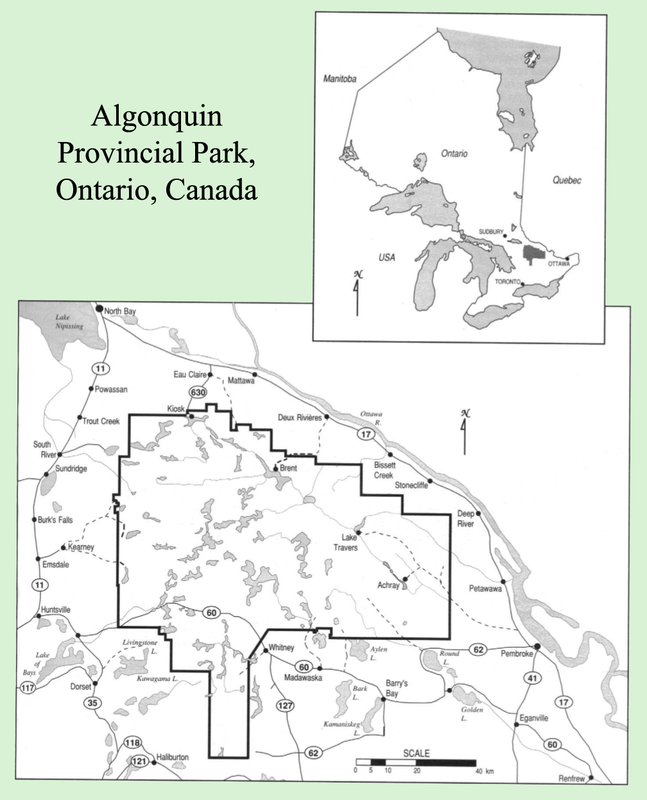 The first provincial park in Canada, Algonquin Provincial Park was established in 1893 and lies in a transition zone between deciduous and coniferous forests, creating habitat for more than 1,000 plant species, 53 fish species, 272 bird species and 53 mammals, including wolves, moose, deer and bears. According to the park's management plan, Algonquin attracts over half a million visitors per year as a destination for canoeing, hiking and backcountry camping. Algonquin Provincial Park's most famous artistic legacy is as inspiration to the Canadian painters, the Group of Seven, in particular Tom Thomson. Much of the park interior is open to industrial logging, which is prohibited throughout the rest of the Provincial parks system. Established in 1892, Adirondack Park was constitutionally protected as "Forever Wild" and stretches across 6 million acres — an area bigger than U.S. national parks Yellowstone, Yosemite, Grand Canyon, Glacier and Great Smoky Mountains combined. According to the Adirondack State Agency, the park has more than 3,000 lakes, 30,000 miles of rivers and streams, and various habitat types, including globally unique wetlands and old growth forests. Adirondack Park has been described as "America's cauldron of conservation" for its unique melding of protected wilderness and private settlement. New York State owns 43 percent of land (roughly 2.6 million acres) within the park’s boundaries, which is protected as Forest Reserve. On the remaining private lands, there are 103 towns and villages, in which about 130,000 people live year-round. Forestry, agriculture and recreation make up the park's economic base. Located on the Canadian side of the St. Lawrence River, Thousand Islands National Park (NP) was the first Canadian national park established east of the Rocky Mountains, in 1904. Today, the park spans is the third smallest Canadian national park and consists of 26 islands, 80 inlets and shoals, three mainland properties and a visitor centre in Mallorytown, Ontario. More than 70,000 people visit the park each year; more than 400,000 experience the park's islands via tour-boat travelling, according to the park's 2010 management plan. 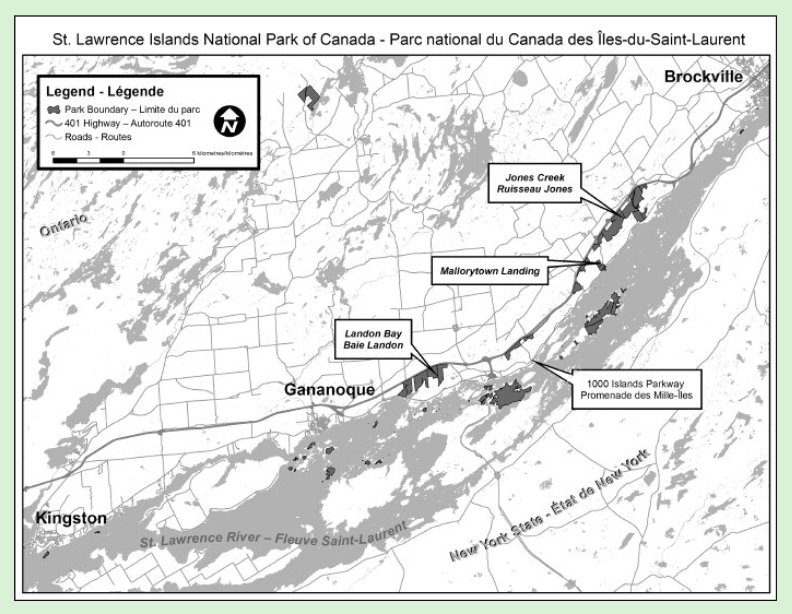 Ecologically, Thousand Islands NP is situated at the intersection of two great landscape corridors: the Frontenac Arch (linking the Canadian Shield to the Adirondack Mountains) and the St. Lawrence River Valley (connecting the Great Lakes to the Atlantic Ocean). As such, the park boasts high biodiversity and is home to many species at risk. Like all other national parks in Canada, Thousand Islands NP is managed for ecological integrity, which given its small size, necessitates a regional perspective and partnerships outside the park boundaries. Fragmentation is a serious threat to Thousand Islands NP. A2A also contains a diverse list of provincial and state parks, nature reserves, state forests and wildlife management areas, waterway parks and areas of natural and scientific interest. At the centre of A2A is the Frontenac Arch Biosphere, which was designated in 2001 and extends roughly 2,700 sq km (1,700 miles) in southeastern Ontario. The area includes the islands and islets of the St. Lawrence River — important stepping stones for the migration of plants and animals. This land bridge of the Frontenac Arch is crucial for connecting the Algonquin Highlands, in Ontario, to the Adirondack Mountains, in New York State. According to UNESCO, "The Frontenac Arch is a unique chorus of people, landscapes and living creatures." In the U.S., the Champlain-Adirondack Biosphere Reserve, which includes Adirondack Park, was designated in 1989. 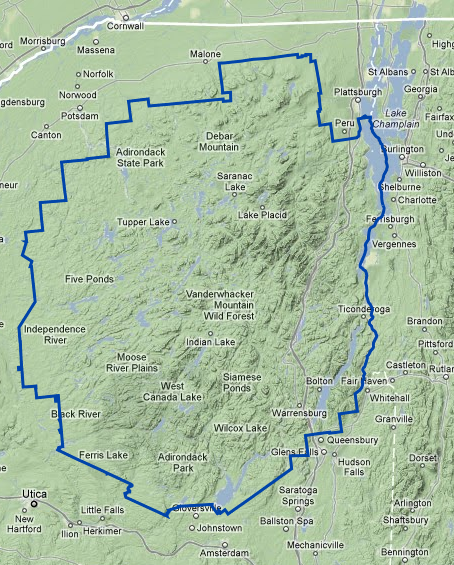 The reserve straddles the border of north-central New York and northwestern Vermont. Lake Champlain, the sixth largest lake in the United States, and the Adirondack and Green Mountains are the central features of the biosphere reserve. According to UNESCO, the primary goal of the Champlain-Adirondack Biosphere Reserve is to use education, research, and demonstration projects to encourage social and economic vitality and to preserve and improve the environmental health of the region. Adirondack Park, New York, U.S.